was prepared by Chef Freda Gore. Chef Freda is the owner and chef tour host of Caribbean Culinary Tours which specializes in culinary vacations and retreats to the Caribbean. This refreshing, tropical fruity salad makes a perfect spring light lunch. When choosing the Papaya - look for really ripe and fragrant papayas for the best flavor. Wash the papayas and cut in half lengthwise. Remove the seeds and discard. Reserve (4) of the papaya halves, and cut the remaining two halves into chunks. Place papaya chunks in a medium bowl, add the lump card meat, lime juice, olive oil, salt and pepper. Lightly toss all ingredients being careful not to over mix to prevent the papaya from breaking. 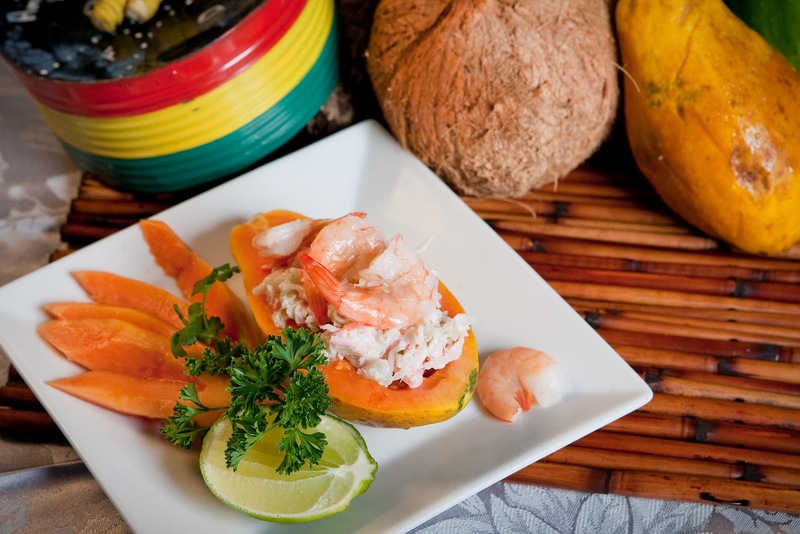 Place reserved papaya halves on (4) serving plate top with mounds of crab salad garnish with lettuce leaves or sprigs of parsley. Top with (2) steamed shrimp, and chill until ready to serve.